Shivarathri or ‘Shiva’s Great Night’ is a celebration that has special significance to dancers and students of dance. Mahashivaratri, is an auspicious Hindu festival that is celebrated on a moonless night in the Hindu month of Phalguna that corresponds to February – March in English Calendar. According to the Ramakrishna Mutt, the Puranas contain many stories and legends describing the origin of this festival. One of it states that during the churning of the ocean by the gods and the asuras, malicious venom that emerged from the ocean .To protect the world from its evil effect, Shiva drank the deadly poison but held it in his throat instead of swallowing it. This made his throat turn blue, and he was given the name Neelakanta, the blue-throated one. Shivaratri is the celebration of this event of protection graced by Shiva. The ocean is compared to the human mind and the process of churning to meditation. In the hours of meditation, the sadhaka or spiritual aspirant churns his own mind. There is a constant war between the devas and the asuras, that is, between the good and the bad tendencies (samskaras) accumulated in the sub-conscious mind. During the process of churning of the mind, both good and bad tendencies surface to the conscious mind. Spiritual aspirants pay and seek the blessings of Shiva (who is none other than their own divine Self) to digest all these poisons without getting affected by them. Then alone will they be able to manifest their divine nature and obtain the pot of nectar – Amruta Kumbha – that is immortality. According to another Purana, Shivaratri symbolizes the wedding day of Lord Shiva and Parvati. Many however, believe, Shivaratri is the night when Lord Shiva performed the Ananda Tandavam – the dance of primordial creation, preservation and destruction or layam(Unison) as it is beautifully held in India. The Ananda Tandava itself is caught in the famous Chola Bronzes that have almost become an iconic representation of Indology. 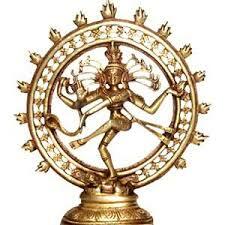 Lord Shiva in this form is called NATARAJA (Nat- dance, Raja meaning King). Shiva’s dance indicates a continuous process of creation, preservation and destruction. Apart from the geometric symmetry there is lot of symbolism attached to this icon.The Damaru (drum) represents the principle of shabda (sound) and creation. Fire represents pralayagni, the fire that destroys the world at the time of dissolution of the world. The right hand in Abhaya Hasta(Pathakam) denotes protection. Together they represent the continuous cycle of creation, preservation and destruction. The other left hand, pointed towards the lifted Kunchitapada (Pointed feet) indicates salvation to those who take refuge at His feet . The Evil Dwarf, the Apasmara-purusha sometimes referred to as Muyalaka, on which Shiva stands in Stithapada(Firmly rooted feet) symbolizes the Lord crushing ignorance . In essence this statue depicts the Panchakriya or Five responsibilties of the Supreme , namely, creation, protection, dissolution. dispelling illusion and salvation. Shivrathri is celebrated all over India with devotion. Many Saivite temples conduct the Natyanjali ( the offering of dance ) dance festivals as part of the celebrations. Chidambaram Natyanjali and Thanjavur Brahan Natyanjali are part of the Dance festivals mentioned above. Shivarathri this year (2008) falls on March 6th ,i.e tomorrow.